Online master's in accounting programs prepare graduates for an array of career choices, including tax auditing, corporate management, financial information systems, and investigative or forensic accounting. The field is growing for accountants and auditors. Admission usually requires a bachelor's degree in a business field, plus acceptable GMAT or GRE scores. Many programs also require a minimum undergraduate GPA. Read more here. Most master's programs take two to four years to complete. Some schools offer their program at an accelerated pace. For more accurate information, students should check with their prospective school. Read more here. Yes, but students should specifically look for accounting degrees from accredited institutions. Students should check whether a school has regional accreditation, and if its accounting program has accreditation from the AACSB. Read more here. Many of the nation's finest business schools now offer affordable master's in accounting (MAC) programs completely online, giving students the opportunity to continue working while they earn credit toward their degree, which should give them an edge in the increasingly competitive business world. Master's graduates are more desirable than accountants with undergraduate degrees, and they earn more right out of college. Corporations from all over actively court MAC accountants before they even finish school. The accounting industry is projected to add more than 139,000 jobs by 2026, according to the US Bureau of Labor Statistics. Accountants understand the importance of getting the most value for their dollar, including dollars spent on education. Students should consider what they receive for their investment, and make a holistic evaluation of affordability. That's why we've ranked the following online MAC programs using our unique college affordability score, which accounts for quality of education, total cost, financial aid opportunities, and potential future earnings. Affordable schools promise a return on investment. They demonstrate track records of providing rigorous academic experiences for an affordable cost, and their graduates earn salaries that make paying back their loans relatively simple. Enrolling more than 29,000 students annually, UNC is one of the largest colleges in North Carolina and the oldest, tracing its origin back to 1789. UNC’s online master’s in accounting offers concentrations in income tax accounting or auditing. Both paths include core courses, concentration courses, and electives to help students specialize their skills. UNC offers the same tuition rate to students regardless of residency status. An MBA and a master’s of accounting are a popular combination, and students who already possess an MBA from an AACSB-accredited school may be able to earn their accounting degree faster, with just 37-40 credits required for graduation. The general program requires 45 credits. Most learners complete the program within one to three years. Students from accounting and non-accounting backgrounds are encouraged to apply, and those with significant accounting experience may also be able to complete the degree with fewer credits. Courses are delivered through live web-cam sessions, pre-recorded lectures, and messaging systems. Rutgers, founded in 1766, is one of the oldest colleges in the country and the largest in New Jersey, operating campuses in New Brunswick, Newark, and Camden. The school’s master of accountancy in governmental accounting is a 30-credit, part-time program that gives students the option to take some classroom courses at the school’s Newark or New Brunswick campuses. The curriculum prepares students for positions in government accounting, financial management, and auditing. The program consists of 21 credits of core courses, such as government budgeting systems, public financial management, and public sector auditing. The program also has learners take nine credits of electives, which allows them to explore professional interests. Students have the opportunity to pursue a 12-credit graduate certificate in financial management, which can be applied towards the degree. Rutgers offers in-state tuition to all online students, regardless of state residency, which makes the school’s master’s in accounting online a smart choice for government employees in all states. UTD, part of the University of Texas System, serves over 26,000 students from its campus in Dallas and through online offerings. The college’s Jindal School of Management is nationally recognized for its business programs, including an online master’s of accounting. The degree has two enrollment options: cohort and flex. The cohort program has a group of students complete all courses together in the same sequence. The flex program allows students to work at their own pace and choose their own sequence of courses. Students in the flex program can pursue specializations in assurance services, taxation, public accounting, corporate accounting, internal auditing, or accounting systems. The cohort format requires learners to specialize in public accounting. The flex program offers start dates during the fall, spring, and summer semesters, while the cohort program only offers one start date in the fall. Both tracks require 36 credits for graduation. Golden Gate University, based in the city's financial district, offers a range of professional graduate degrees, including a master’s degree in accounting online. The program prepares students to sit for either the certified public accountant or certified management accountant examinations. The self-paced degree can be completed in 2-4 years, with options for full-time or part-time study. The degree offers three concentrations: generalist, forensic accounting, or taxation. Each track requires 45 credits for graduation. The core consists of 33 credits dedicated to business law, communication and analysis of financial information, and accounting responsibility and ethics. The concentration requires students to earn 12 credits. Each concentration includes a set of required courses along with electives that allow students to delve deeper into specific subjects. GGU encourages all students to participate in an internship and can help arrange local opportunities for online students. George Mason is the largest public college in Virginia, serving more than 34,000 students annually through in-person and online programs. The school’s master of science in accounting offers courses in a modular, quarterly format, allowing students to take two courses every 10 weeks. The degree is only available in a part-time format and can be completed in two years. The 30-credit curriculum includes five core courses that cover topics such as fraud examination and advanced issues in taxation. A professional accounting colloquium is required. Elective courses comprise the other half of the degree, allowing students to pursue any area of accounting that interests them (with approval from a program advisor). All online students must take a three-credit global accounting environment course, which includes a weeklong residency abroad. BU, based in Bellevue, Nebraska, is a public college with a focus on nontraditional education. The school’s fully online master of accounting helps students develop skills in communication, critical analysis, and technical accounting practices. The program meets education requirements for the certified public accountant exam and also prepares graduates for other positions such as controller and internal auditor. The curriculum includes 36 credits, with 27 dedicated to core courses such as financial auditing, accounting information systems, and accounting theory. Students take nine additional credits from the school's MBA program, which includes business analysis, financial management, and operations and logistics. Students also have the option to specialize in tax or finance, which requires an additional nine credits. Students can complete a three-credit internship course as part of the core curriculum, which requires a professional accounting organization and an approved plan of study by a faculty member. WGU is a unique, online college that emphasizes professional education for nontraditional students, including a flexible online master’s of accounting program. The program emphasizes the technical, analytical, strategic, and communication skills necessary for success. The curriculum prepares students to sit for industry standard professional exams, including certified public accountant, certified management accountant, and certified internal auditor. The program requires students to earn at least 30 credits to graduate. Major courses cover topics such as management communication, advanced tax concepts, strategic management, and forensic accounting. WGU uses a competency-based model, allowing students who possess relevant subject knowledge to easily test out of courses covering material they already know. Coupled with the school’s flexible curriculum organization, which allows students to complete as many courses as they want each semester, this can help online students save on tuition. Southern Utah's online master of accountancy gives students an understanding of tax code and financial regulations for the public, private, and nonprofit sectors. The degree consists of 30 credits, with concentrations in management, public accounting, or taxation. Students are not required to choose a concentration. Students take 12 core credits, including courses in business law, auditing, and accounting ethics. The remainder of the curriculum includes six credits in concentration courses and 12 credits in additional electives, which includes the option for a three-credit internship. Accounting students can also pursue a dual degree that pairs the accounting curriculum with an MBA, requiring an additional 15 credits to earn both degrees. SUU boasts a strong job placement rate, with 99% of accounting students finding employment in the field within six months of graduation. UConn, located in Storrs, is one of the most prestigious public colleges in New England. The master of science in accounting was the school’s first online master’s degree, and today, the program is one of the most acclaimed in the Northeast. The curriculum combines elements of accounting and the school’s MBA, allowing students to gain hard skills in tax code and financial analysis, along with soft skills in business communication and management. UConn offers a flexible course selection, allowing students to design their own program of study; the degree requires only two core classes. Students select eight additional electives to complete course requirements. Students can pursue a selection of accounting topics, including data analytics, fraud examination, global financial reporting, and advanced assurance services. The program is offered entirely online except for one mandatory, four-day campus residency in Hartford. AU, located in Auburn, Alabama, offers one of the top online master’s in accounting programs. The degree helps students build skills in research, technical accounting, and communication, preparing them to pass the uniform CPA exam. Auburn graduates boast a high success rate on the exam, with more than 80% passing on their first try. The curriculum includes a total of 30 credits, with 12 credits dedicated to core courses, such as advanced auditing, federal tax research, and integrated accounting applications. Students complete the other 18 credits through elective courses, with options including real estate finance, advanced business law, and information risk analysis. While all course material is delivered online, students must attend a three-day campus residency that takes place during their final spring semester. The campus session allows students to participate in the Auburn MAcc Leadership Summit, with opportunities for business seminars, workshops, and social events. SUNY Poly, established in 1966 in Utica, New York, serves as the state’s public polytechnic college, offering professional education to over 3,000 students annually. The school’s master of science in accountancy was created to satisfy demand for trained accountants who can pass the certified public accountant and certified management accountant exams. Graduates are prepared for positions in public, private, non-profit, and government accounting sectors. While the program is primarily intended for students with undergraduate accounting degrees, those without a significant accounting background may enroll after fulfilling additional prerequisite coursework. Students are required to earn at least 33 credits, with 15 dedicated to core accounting courses, 15 to core business courses, and three to electives. SUNY Poly offers an optional concentration in forensic accounting and valuation. The concentration requires students to take three additional courses: fraud examination, financial statement investigation, and either accounting information systems or business and forensic valuation. Regis, a private Roman Catholic college in Denver, Colorado, is one of the top educational institutions in the state. The school offers a flexible course schedule, with start dates every eight weeks. The online master’s of accounting program requires 30-48 credits, depending on student experience. Those with a strong accounting background can typically forgo the 18 credits of foundation courses, completing the degree with just 30 credits. The program core includes nine credits in financial communication, accounting ethics, and interpreting accounting information. Students also take 18 credits in electives that allow them to pursue professional interests and customize their degree, with options including forensic accounting, controllership, and international accounting. For interested students, Regis offers the opportunity to perform a three-credit internship in a professional financial environment. All students end the accounting program with a three-credit capstone course that focuses on business planning and strategy. UMUC, a public college in Adelphi, Maryland, offers a master of science in accounting and financial management that’s designed for mid-career professionals looking to move into management positions. The degree teaches students the skills they need to manage financial operations and make long-term decisions about company finances. The 36-credit program includes 27 credits of core courses, focusing on major topics such as behavioral finance, investment valuation, and federal income taxation. Students choose two additional elective courses, with options including government and not-for-profit accounting, fraud examination, accounting ethics, and international accounting. The program concludes with a three-credit capstone course in accounting and financial management, which has students integrate course material to analyze a relevant issue in the field. Graduates are prepared to sit for a range of professional certification exams in areas such as accounting, financial management, auditing, fraud, information systems, and taxation. UMassOnline, created in 2001, is the UMass System’s online education platform, which offers more than 150 degrees and 1,500 courses entirely online. 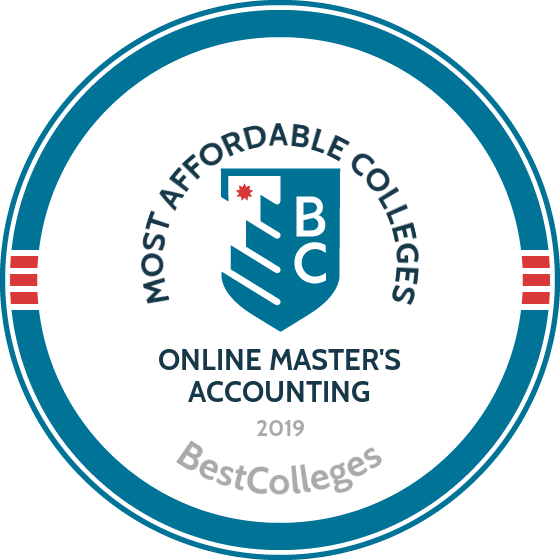 The master’s of accounting online requires a total of 30 credits, with 15 credits of core courses, six credits of accounting electives, and nine credits of business electives. Students in the program gain an in-depth understanding of concepts in governmental and nonprofit accounting, corporate finance, advanced auditing, globalization, and forensic accounting. The curriculum prepares learners for upper level positions in government, nonprofit, and corporate accounting environments. Online students receive a range of support services, including technical support, tutoring, and library services. Students also have access to academic advisers and program coordinators, who can help with course selections, degree planning, and other academic issues. Due to state regulations, UMass is unable to admit online students who are residents of Arkansas, Kansas, and Minnesota. UAB serves more than 18,000 students annually and is one of the largest colleges in Alabama. The school is well known for its online programs, including a master’s degree in accounting online. The 30-credit program consists of 21 credits in core courses, building advanced knowledge in topics such as business law, corporate governance, tax entities, and auditing. Students are required to complete at least nine credits of electives, giving them the opportunity to explore topics in forensic accounting, fraud examination, governmental accounting, and teaching. Students can earn their degree in five semesters. The program is offered full time or part time. For students who lack an undergraduate accounting degree or significant work experience in the subject, UAB offers a 24-credit bridge program that covers the fundamentals of accounting and prepares students for graduate study. Emporia State, one of six public colleges in Kansas, boasts strong business programs that date back to 1868. The School of Business is also accredited by the AACSB International, a distinction held by fewer than 5% of all business schools worldwide. The master of accountancy is available either fully online or in a hybrid format that allows students to take some campus courses at the school’s Emporia and Kansas City locations. Students are required to earn at least 30 credits, which are split equally between core courses and electives. Core courses focus on topics in auditing, management, accounting theory, and information systems. Electives allow students to explore specialized subjects such as enterprise resource planning, managerial economics, law of commerce, and business analytics. ESU caters to working students, offering full-time and part-time options that allow students to complete the program at their own pace. US, a Catholic, Jesuit college in Scranton, Pennsylvania, has offered comprehensive education informed by Christian ethics since 1888. Focusing on technical skills, communication, management, and ethics, the master of accountancy prepares students for leadership roles in the global business environment. The program combines practical skills with a Jesuit perspective of social responsibility. The 30-credit degree includes 15 credits in core courses, 12 credits in advanced electives, and a three-credit capstone course, which has students apply overall program learning to an accounting research question. Scranton is committed to student success on the Certified Professional Accountant exam, and the school offers accounting students a discount on the Wiley CPAexcel preparation program. Offering a video lecture format and comprehensive analytical tools to help students track progress, the CPAexcel program leads to a 90% pass rate on the CPA exam, with free course repeats offered for students who don’t pass on their first try. Indiana Wesleyan, a private liberal arts college affiliated with the Wesleyan Church denomination, has offered Christ-centered educations since 1920. The school’s master of science in accounting emphasizes a legal, ethical, and biblical framework, integrating technical knowledge with a Christian approach to business. The program operates in a cohort model, allowing the same group of students to move through the curriculum together and provide mutual support for one another. Courses are generally taken one at a time in a set sequence, with 30 credits required for degree completion. Major topics include critical thinking and business communication, advanced managerial accounting, corporate taxation, and accounting information systems and control. This fully online program offers several start dates throughout the year, providing maximum flexibility for working students. IWU also offers the same tuition rate regardless of state residency and requires no campus visits. MC, based in Clinton, Mississippi, is the second oldest Baptist college in the country, with a history that dates back to 1826. With more than 5,000 students, MC also ranks as the largest private school in the state, and online students can pursue a range of graduate degrees, including an online master’s in accounting. The degree is offered as a master of business administration with an accounting concentration, combining general business and management knowledge with technical accounting skills. The curriculum requires 30 credits, split evenly between business and accounting courses. The MBA core includes courses in financial management, policy formulation, and global economy, while the accounting component covers subjects such as federal tax accounting, auditing concepts, and accounting theory. Online students can also pursue a graduate certificate in accounting, intended for bachelor’s degree holders who did not major in accounting but wish to sit for the CPA exam or change careers. New Castle, Delaware, is home to Wilmington University, a private college that serves more than 20,000 students annually. As one of the largest schools in the state, Wilmington boasts a large selection of distance education programs, including an online accounting master’s degree. Students explore the theories and practices of accounting, gaining the skills to serve as certified public accountants, managerial accountants, or certified fraud examiners. The program consists of 30 credits, with 24 credits of accounting major courses and six credits in accounting electives. Students learn to apply reliable measurements to financial data, identifying and analyzing business and audit risks. Depending on availability and location, students may be able to take some courses in person. Southern Adventist, founded in 1892 in Collegedale, Tennessee, is the oldest Seventh-day Adventist college in the South, having provided a Christian-centered education for over 125 years. The school offers an online master of business administration with an emphasis in accounting, combining the MBA core with student-selected courses in accounting. The 36-credit degree includes 24 credits of MBA courses, focusing on topics such as financial management, organizational behavior, strategic decision making, and the integration of faith and business. Accounting courses make up 12 credits, though there are no course requirements, allowing students to explore the field as it fits into their personal and professional goals. The accounting component includes one three-credit elective in a related field, such as human resources, marketing management, or healthcare administration. Students who lack an accounting background can enter the program after taking 12 credits of accounting prerequisites, including financial accounting and principles of finance. Edgewood, a private, Dominican, Catholic college in Madison, Wisconsin, offers a flexible master of science in accountancy that can be completed within two to three years of part-time study or just one year of full-time study. Designed with working students in mind, the master’s in accounting online has three start dates: fall, spring, and summer semesters. The curriculum requires students to earn at least 30 credits, with 12 credits allocated to business courses, such as executive communications, business ethics, and business law. Students also take at least 15 credits of accounting courses and three elective credits, which can include an internship. The program prepares students to sit for the CPA or CMA exams. Accounting students receive a discount on Becker CPA Review and Gleim CMA Review courses--two of the most respected accounting test prep programs in the country. Nova Southeastern, based in Davie, Florida, serves more than 24,000 students annually, with thousands enrolling in online programs. The school’s online master of accounting emphasizes value driven management, preparing graduates to pursue leadership positions in the field. This flexible program offers start dates in August, January, and May, and students can complete the degree in 21 months. The curriculum requires students to earn at least 39 credits. At least 18 credits must be in major accounting courses, such as financial statement analysis, fund accounting, and information and control systems. The remaining 21 credits are dedicated to elective courses that allow students to explore a range of accounting subject areas. Options include IRS practice and procedure, corporate taxation, financial accounting and research, and advanced business law. The master’s in accounting online program curriculum meets all requirements for the CPA and CMA exams, preparing students for Florida certification. Stetson, one of just 180 business schools worldwide to receive full accreditation from the Association to Advance Collegiate Schools of Business, offers a flexible online master of accountancy. The program is designed for working students, allowing them to maintain career responsibilities while earning their degree. Students learn technical accounting skills along with related skills in business and information systems. Graduates are prepared to pursue mid and high-level career opportunities in the field. The degree, which requires students to earn 30 credits, includes 15 credits of core accounting courses and three credits in either data analytics or managerial decision-making. The remaining credits (12) are electives, which include topics in managerial accounting, information technology in business strategy, and business law. Students can complete the master’s in accounting online program with one year of full-time study. Western New England, located in Springfield, Massachusetts, is a private college that’s home to several online programs, including an affordable master of science in accounting. The online master’s of accounting can be completed with 15 months of part-time study or with 10 months of accelerated, full-time study. The curriculum prepares students to sit for the CPA exam in Massachusetts or Connecticut, while also teaching them advanced skills in analysis, evaluation, planning, and controlling. Students must earn 30-33 credits, with 21 credits dedicated to major courses that combine business and accounting skills, including cost-based decision making, corporate and partnership tax, and managerial finance. Students can pursue an optional nine-credit concentration in forensic accounting and fraud investigation, which explores techniques for examining financial fraud and offering litigation support. Students who forgo the forensic accounting concentration choose from an additional 9-12 credits in accounting electives, focusing on professional interests. Many of the most affordable online master's in accounting programs are also the highest quality. Details may vary by school and program, but applicants can expect common application procedures, concentration offerings, and coursework as part of their accounting degrees. The length and cost of each program also varies, but the following section includes general estimates of completion times and tuition prices for a master's degree. Online accounting master's degree applicants need a bachelor's degree. Some master's programs specify that applicants must possess a bachelor's degree in business, finance, accounting, or a related major, but many welcome applicants with bachelor's degrees in other subjects, as well. Additionally, some schools require that students earn their bachelor's degrees from an institution with regional accreditation in order to qualify for admission. Some schools also require previous work experience, but many of the most affordable online master's in accounting degrees do not. Completing the degree provides graduates with a broader scope of lucrative job opportunities. For any master's degree, minimum GPA requirements can vary widely, though most of the best master's in accounting online prefer a minimum 3.0 GPA. Many programs do not require GMAT or GRE scores; however, those that do may waive this requirement for applicants with a bachelor's degree in accounting, extensive work experience, or a GPA above the school's minimum requirement. Online MAC programs offering a taxation concentration introduce students to critical income, estate, and sales taxation principles and practices. Students develop a mastery of auditing, financial reporting, and tax law for corporate, nonprofit, and individual clients. Graduates also qualify to sit for the CPA exam. The auditing concentration within an online master's degree in accounting prepares students to follow Sarbanes-Oxley federal requirements in their career, and introduces the latest auditing technologies and techniques. The curriculum emphasizes coursework in advanced auditing, ethics in accounting, and detection and prevention of fraudulent financial statements. Students concentrating in forensic accounting as part of an online MAC program study fraud investigation, specifically related to bankruptcies, contract disputes, mergers and acquisitions, and complex financial agreements. Aspiring forensic accounting experts also learn how to use forensic financial evidence in the prosecution of white-collar criminals. The management accounting concentration teaches students to strengthen business and leadership aspects of their role as accounting manager. Coursework prepares students to lead teams of employees, including at the managerial/executive level, to improve financial productivity and efficiency within an organizations. Graduates qualify to sit for the CMA exam. Online MAC programs in international accounting train students to practice accounting and comply with tax laws in a global environment. Coursework explores how international taxation and accounting regulations compare to U.S. systems. Graduates possess a mastery over foreign exchange rates, related financial risks, and management of global financial systems. Financial Reporting: A crucial skill in any accounting occupation, a course in financial reporting provides students with a comprehensive understanding of international accounting, consolidation reporting, SEC regulations, and reporting practices specific to corporations in financial distress. Financial reporting coursework at the graduate level also trains students in advanced tax preparation for individuals and corporate clients. Advanced Auditing: Coursework in advanced auditing builds on a student's prior knowledge of auditing principles and practices, introduced at the undergraduate level. Topics include common auditing errors, auditing follow-up protocol, and ethical concerns specific to this occupation. Most courses in this subject incorporate a combination of case studies, current auditing research, industry promotional materials, and student-led presentations. Business Law: This course examines the law in the context of business, stressing the importance of legal compliance and ethical practice in the corporate decision-making process. Topics include contracts, product liability, tort litigation, and internet and employment law. A necessary component of many accounting careers, business law courses also often explore international rules and regulations. Globalization and Managerial Economics: Coursework in globalization and managerial economics explores and compares international taxation laws, financial reporting methods, and accounting practices. Students develop a critical understanding of the global marketplace, essential to aspiring international accountants and domestic tax and finance experts alike. Corporate Financial Management: This course provides an in-depth exploration of financial management from a corporate perspective, examining capital structure, corporate policy, portfolio management, budgeting, and global executive markets. Students develop a working knowledge of risk-assessment methods specific to corporate finance shareholder valuation. While completion times for the most affordable online accounting degrees vary, most students complete a master's degree in two years. Many online schools offer the degree in an accelerated format, which typically takes less than 24 months to complete. Most online accounting master's degrees do not include residency requirements, but students who choose to complete courses on-campus may take longer to earn the degree. A master's in accounting comprises roughly 60 course credits. Students must consider whether to pursue a part- or full-time schedule, and may choose either a self-paced or cohort learning program. Many schools follow self-paced learning models for maximum flexibility, enabling students to take as many courses as they prefer per semester. In other cases, cohort-style learning requires all students in a group to complete their coursework simultaneously. How Much Does an Online Master's in Accounting Cost? As with any degree program, the cost of even the most affordable online master's in accounting varies. Each school dictates its own fees for tuition, which may vary depending on whether students are in-state or out-of-state. Some programs may also include fees for services and facilities used exclusively for online learning, such as technology fees, test proctoring, and virtual labs. Applicants should always research tuition prices at their preferred schools, and explore their own personal financial aid options to understand the full cost of earning a master's in accounting. The average amount spent for graduate school is $24,812, according to Sallie Mae. The American Institute of CPAs offers the CPA credential to aspiring public accountants through individual state boards of accountancy. AICPA provides the same universal exam to all CPA candidates regardless of location, but test takers may need additional education or experience, depending on their state of residence. Most states require at least a bachelor's degree and two years of professional experience to take the CPA exam, which comprises four, four-hour sections. The CFA Institute offers the CFA credential to students who aspire to work in portfolio management and high-level investment analysis. Candidates must hold a bachelor's degree and pass a three-part CFA exam. They must also complete four years of experience working in investments and become a member of the CFA Institute to obtain their charter and become CFA-certified. The Institute of Management Accountants offers CMA certification to candidates aiming for executive financial management positions. The CMA exam tests students' expertise in financial reporting, performance, control, and planning, plus their financial decision making skills. The IMA requires aspiring CMAs to hold a bachelor's degree in accounting or professional accounting certification, complete at least two years of work experience, and pass the exam to obtain certification. While largely technical in nature, most online master's degrees in accounting include some additional requirements, such as an internship, and culminate in a capstone or thesis. Most master's-level accounting internships encompass three credits, which students complete through placement in a local accounting firm or financial institution. Some programs even coordinate paid internships. An online master's degree in accounting typically concludes with a capstone course in lieu of a thesis requirement. Students beginning their school search should narrow their options to only include accredited programs. Colleges and universities may hold regional or national accreditation through a recognized accrediting agency. Either type of accreditation is acceptable, but regional accreditation is generally more common and preferable among many top schools. In some cases, colleges with regional accreditation only accept transfer credits from other regionally accredited institutions. Students should confirm their school's accreditation status through a legitimate agency overseen by the Department of Education U.S. Department of Education (ED) or the Council for Higher Education Accreditation (CHEA). In addition to institutional accreditation, the Association to Advance Collegiate Schools of Business (AACSB) gives accreditation to some business degrees and some of the nation's most affordable online master's in accounting. Programmatic accreditation cannot replace institutional accreditation, but AACSB recognition highlights the industry's most relevant and valuable accounting programs. Employment for accounting master's degree graduates varies by location, employer, and individual requirements. As with most occupations, candidates with advanced degrees and professional experience qualify for the most lucrative jobs in accounting and finance. Populated by Payscale data, the table below highlights the median salaries for accountants and finance professionals through all career stages. Graduates of online accounting master's degrees can pursue a variety of career paths and fields of expertise. Aspiring accountants with an eye for detail should demonstrate dexterity in crunching numbers, and have a thorough understanding of mathematical functions. With qualifications exceeding the minimum education requirement for most entry-level jobs, candidates with their master's degrees can pursue advanced positions in fields including accounting, auditing, and finance management. Accountants and auditors prepare and thoroughly examine taxes and other financial records, respectively. They help ensure individuals and corporations can follow financial rules and regulations and operate efficiently and lawfully. Accountants must obtain CPA certification through their state board to file SEC reports -- another critical requirement of a tax preparator. Most employers accept candidates with their bachelor's degrees and CPA certification, but master's degree holders may qualify for advanced positions in finance. Budget analysts help clients manage their finances by evaluating their spending habits, drafting or amending their budget, and monitoring their expenditures. These professionals may work for public or private institutions, ranging from large corporations to individual business owners. Most budget analyst employers require at least a bachelor's degree, though some government agencies may also require the certified government financial manager credential. Cost estimators help estimate the money, labor, time, and materials necessary to complete a project, make a product, or provide a service. Most budget estimators work in construction, manufacturing, or auto repair. Employers prefer candidates with a bachelor's degree in finance, business, or a related field, plus work experience in their area of expertise. Financial analysts help clients make informed investment decisions by analyzing the risk and performance of bonds and stocks, and make investment recommendations to improve the overall health of clients' financial portfolios. Candidates should hold their bachelor's in finance, accounting, mathematics, statistics, or economics. Some employers may require a FINRA license for sales positions, while others may sponsor CFA certification for new-hires. Financial managers oversee all financial operations of an organization, corporation, or private client. They help their clients reach long-term financial goals by drafting finance reports, advising on investments, and creating a budget with a focus on overall financial health. Candidates should hold a bachelor's degree and work in accounting, security, sales, or financial analysis for at least five years to pursue this career. Joining a professional accounting or finance organization can provide students with benefits not available anywhere else. Students often receive discounted membership rates as an incentive to join a professional organization while still earning their degree. Members enjoy perks including networking opportunities, continuing education courses, and career placement services. The following represent some of the largest and most reputable accounting and finance organizations. AICPA claims the largest membership of accounting professionals in the world, providing services such as career guidance, industry certification, and continuing education since 1887. The organization offers free membership to student affiliates, including scholarship opportunities and member discounts. NSA offers benefits to both active and associate members, providing year-round tax assistance, advocacy support, and access to industry publications. Members also enjoy a 15-month membership for the price of one year, and discounts on insurance and cybersecurity software and services. IMA offers four types of student membership: academics, professionals, and staff, all employees within an organization. IMA emphasizes career development and professional networking opportunities, and awards certification to qualified candidates aspiring to the CMA or CSCA credential. CIMA represents the largest membership of professional management accountants in the world. The organization promotes career development and continuing education through membership, with perks including access to the Future of Finance series and Financial Management magazine. MGI Worldwide provides member benefits with a global focus, open to all accounting professionals and especially helpful to current and aspiring international accountants, auditors, tax managers, and consultants. Serving diverse members and clients around the world, the organization offers unique multicultural networking and career opportunities. Most U.S. college students need financial aid to fund their degree. Regardless of a student's major or socioeconomic status, they may qualify for one or multiple financial aid resources. Common options include federal funding, scholarships, grants, and work-study. All financial aid programs and most schools require students to complete the Free Application for Federal Student Aid (FAFSA), which determines students' eligibility for almost all forms of educational funding. Who Can Apply: The Government Finance Officers Association provides this scholarship to aspiring government accountants and finance professionals. Students must show evidence of full-time enrollment in a graduate program, in a course of study related to state, local, or government finance. They must also provide a letter of recommendation with their application. Who Can Apply: AICPA sponsors the Carey Scholarship, providing financial aid to applicants with a background in liberal arts or a nonbusiness field who plan to enroll in a graduate accounting program and pursue CPA licensure. Applicants must hold an undergraduate degree from a regionally accredited school and student affiliate membership in AICPA. Eligible graduate programs receive AACSB and/or ACBSP accreditation. Who Can Apply: Named for its flagship exam-prep product, Wiley Efficient Learning, Inc. offers this award to full- and part-time college students enrolled in at least one accounting course. The grand-prize winner receives a cash award and the Wiley CPAExcel Platinum study course; the runner-up receives the course only. Who Can Apply: The National Association of Black Accountants presents this award to black applicants who hold active NABA student membership. Students must show proof of enrollment in a full-time undergraduate or graduate program in business, accounting, or finance, and hold a minimum 3.3 overall and 3.5 major GPA. Who Can Apply: NABA offers the Member Scholarship Award to recipients with similar qualifications through the NABA National Scholarship Program, in a wider range of cash awards. Applicants must be black NABA members and enrolled in a full-time undergraduate or graduate program in accounting, business, or finance. Students must demonstrate an overall GPA of at least 3.3 and a major GPA of at least 3.5.
Who Can Apply: AICPA grants this award to applicants who belong to a minority racial or ethnic group, and are enrolled in a full-time undergraduate or graduate accounting degree. Students must hold U.S. citizenship or permanent resident status, and at least a 3.0 GPA. Who Can Apply: GFOA presents this scholarship to students pursuing careers in accounting for local or state agencies. Applicants must show proof of full-time enrollment in an upper-level undergraduate or graduate program. Aside from financial aid and scholarships, online master's in accounting students can cut costs in other ways while earning their degree. College students can adopt sensible spending habits while earning their online MAC. The tips listed below represent a few ways students can save money while they pursue a top-notch accounting education. Most students don't know how many discounts are available to them. Establishments like restaurants and clothing stores offer student discounts, as do some professional organizations, technology stores, and media outlets, all of which help supplement a postsecondary degree on a limited budget.